I bought this mascara after reading a great review by Fleur De Force. Having met Fleur and seen her fabulous lashes I felt that we'd have similar mascara values. I am rather fussy. I don't like fat tubes that are uncomfy to hold, I don't like overly chunky brushes that splodge product onto your face, I don't like it when mascara is like ink – adding colour but no volume – I don't like mascaras with fibres in them that create fall-out under the eyes... and so on and so forth. My lashes are quite long but super pale so I like thickening mascaras, generally in black (brown mascara is suspicious). The images show me with no mascara, one coat, and two coats plus eyeliner and shadow. I really like the wand, which is made of rubber and tapered at both ends. The consistency of the mascara is perfect, application simple. 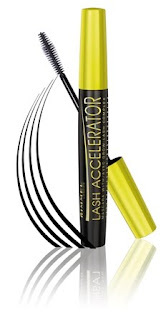 The fact that the mascara contains 'Grow-Lash Complex' to 'promote natural lash growth and create lashes that appear fuller, lusher and up to 117 per cent longer' is a handy bonus. Although if my lashes were 117 per cent longer I'd look like a camel. I'm sceptical as to the likelihood of massive lash growth but I'm content in the knowledge that my mascara is caring for my eyelashes instead of knackering them. The joy of new makeup was somewhat tarnished by a whisper that Rimmel test on animals, but that worry has been somewhat assuaged by Coty's statement on Lazy Beautiful, which assures that they do not (unless specifically required to by 'government'... hmmnn. Vague). I bought my Lash Accelerator mascara from Superdrug, where it's on offer for £6.99 instead of the usual price of £8.99. Probably the best cheapish mascara I've tried and one I'd definitely repurchase. UPDATE: I have repurchased! I bought the new Extreme Black version. I'm not convinced that this mascara made my lashes any thicker or longer but I like the shape of the wand and the effect it gives. I like the look of the brush on this. I'm terrible at getting mascara all over the place (not quite like the young you, but almost) so I need something small and easy to handle. I'd like longer lashes but I don't really think it's going to be likely at this price point. No matter if they look nice though. By the way, re: Coty's statement. Do they not say which products they are required by law to test? It sounds to me like a bit of a dodge of the question with that disclaimer. I would be unsurprised to find mascara is one of the specific items they ARE required to test as it goes. No they don't: "Our research and development team has pioneered safety tests and alternative testing methods in order to eliminate the need for animal testing. However, there may be rare occurrences when a government or regulatory agency may indicate to the Cosmetic Industry that an animal study is necessary, where no validated alternative exists, to ensure consumer protection for a component of our products. In such cases, the need for testing is carefully examined by our Industry and if the test must be performed, it is strictly controlled." Ok, that makes sense. It'll be where they haven't got data for a particular active ingredient, so when it's something completely novel. I know that they've dispensed with most of the testing as there is such a massive library of old data. They can use in vitro tests with skin equivalents too. Hopefully, as they improve on the alternative methods there will be less need to carry out the in vivo testing. It's still vague though and it would probably be clearer to just say, yes we do when it's necessary. I'm sure they could individually label which were animal friendly and which weren't. Thanks for the review - may just have to try this! 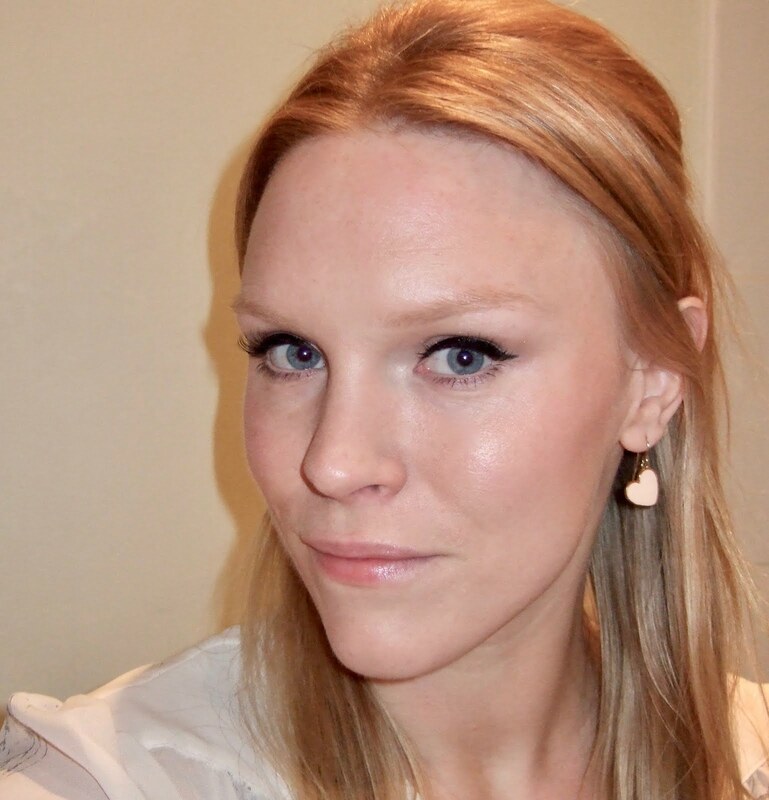 Thanks for the post and the pictures - how does it make your lashes feel? I can't do mascara at all, have long fair wimpy lashes so this may work for me but any whiff of crispiness and my lashes will just curl up and die, sorry bit ott there but 'tis true. @lipstickmama Thanks for your question. It feels fine on my lashes - with only one coat the effect is quite soft and subtle. With two coats lashes are a bit stiffer but it doesn't feel harsh, to me at least. The third photo is actually more like three coats as applying my eyeliner and shadow after mascara made some of it come off. Only at this point were my lashes getting a bit clumpy and stiff. The formulation is designed to be nourishing, so even if it doesn't create amazing growth it at least shouldn't do any harm. My mum can tell by the smell if certain mascaras will make her eyes water - maybe you should have a stiff of a tester! is it worth the money to help her lashes grow of should i keep looking?? Hi Ellie, thanks for your comment. I've been using this mascara ever since this review and I love it. I want to repurchase but am hoping to find it on offer somewhere instead of paying the full £8. I don't think it's made a difference to the length or quality of my eyelashes - but then mine are quite long anyway. But whether it helps my lashes to grow or not, I'm still happy with it as I love the shape of the wand, how effective it is and how I can easily build good volume. Also, I like the fact that it's supposed to be 'good' for my lashes. I think the wand shape might help your friend to avoid the dreaded 'clumpy-lashes-mascara-on-eyelids' problem you mentioned.